Interested in becoming a Reader? The Wheel of Segais Reader Training is now available! All seven sessions have been recorded and edited and you can now sign up for the 7-part on-line Reader Training. Here is a video where you can learn more about the course. As the seed is nurtured and the Wheel of Segais unfurls its tendrils around the world, I hope you will consider taking the next step with me to becoming a Wheel of Segais Reader. Let us use the wisdom of Nature to grow our dreams and the dreams of others from Seed to Harvest. You will need to have received a Personal Reader Kit before your on-line training begins. This is purchased separately – on our Readings page. The cost is $95 NZD plus GST and postage. 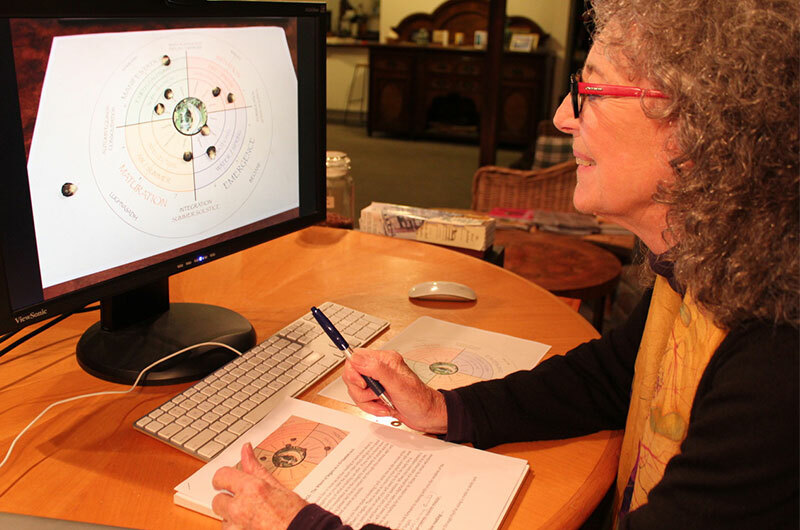 Once you have your Personal Reader Kit you can then enrol for the Reader Training through Global Spiritual Studies – https://globalspiritualstudies.com/product/the-wheel-of-segais/. On purchase you will be sent an access code to enter the Schoology site for homework. If you would like to be kept informed by email of updates, news and further offerings for The Wheel of Segais, you can register interest here. is the previously recorded programme and offers an overview of a reading. You will also receive your own Wheel of Segais Personal Reader Kit which includes a 350mm diameter fabric copy of the Wheel of Segais for casting; a Personal Reader Guide; nine hazelnuts for casting plus two spares; and a notebook and pen for jotting down the Wheel’s answers to your questions. On receipt of the Personal Reader Kit you will be entitled to one free personal reading from me via Skype or other interactive platform. is the final in the series. This covers The Salmon of Wisdom; absences; more complex readings; and drawing a wisdom card for clarity. I will have at least one sample reading and you will be asked to offer your interpretation of the reading, offer insights and ask questions as well as respond to questions following each session. I am also planning a discussion page where students can share their insights and experiences. At the completion of the course you will receive a Certificate of Competency and your own copy of the larger Wheel that I use. I will also be available for limited personal consultation via Skype or other suitable platform. The Wheel of Segais is a simple but profound template for understanding the innate nature of the universe and our place within it.